Is .CO.IN making a comeback? Discussion in 'General Indian Domain Name Discussion' started by CyberKing, Jan 14, 2019. Then there is the new series of cool ads by Raymond featuring a CO.IN site hosted at tailoryourstyle.co.in although booked both names on the same date in Dec.
What is behind this trend...or is this sort of a one off ? .In vs .Co.In – The Big Debate! Aubits, LLL.in King and Jeff like this. We have seen what cheap registrations have done in other extensions and more registrations are not going to result in more sales. 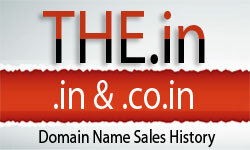 Don't se any benefits here, name recognition is with .in and that is not exactly causing waves in the domain markets. I think it's about flogging off a struggling extension cheaply and making supermarket style profits.